So many wise people have pointed to nature’s ability to heal and restore our body, mind and spirit. Hospitalized patients who can see nature from their windows heal faster than those who can’t. This may have been the origin of the tradition of loved ones bringing flowers to bedsides – friends and family intuitively knew it would lift the patient’s spirits and support healing. We are connected to nature – it nurtures us. Yet modern people tend to stay indoors both at home and at work. Even children have become nature-deprived, and our national health has suffered for it. Why do we do that to ourselves? Excuses may range from: “I don’t want to get sweaty,” “I’m afraid of ticks and bug bites,” “I’m afraid of getting skin cancer,” “I don’t like being cold, wet, or uncomfortable outdoors,” and on and on. Kids used to be told, “Go outside and play.” Do we stop playing because we grow older? Or do we grow older because we stop playing? The fact is, we would be healthier (and feel and look younger) if we made it a priority to build some “nature time” into each day. In some Scandinavian countries, if there are no fresh flowers in the house, someone goes right out to get some. It’s the same as we might do to go get basic foods we would never want to be without. That’s how important their connection to nature is – it’s essential! 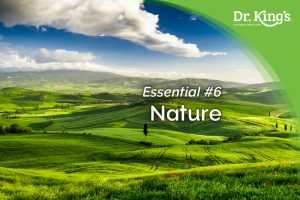 Nature helps us slow down, “feel” and appreciate life – the sheer miracle of life itself, beating our hearts … the breath of life in our lungs … all done without us consciously even thinking about “doing” them. We are not human “doings,” we are human beings. We are living miracles, if we just slow down enough to feel it. Nature helps us do that. Buy a few teaspoons of alfalfa seeds and sprout them in a jar. Rinse often, drain well, and watch the miracle of nature unfold daily as they sprout. As they grow, they develop tiny leaves that will turn greener when placed in filtered sunlight. When mature and ready to eat, appreciate the super-food nourishment these little sprouts provide. Then try sprouting other varieties of seeds, grains, and beans: it’s fun! Get a few houseplants – they purify indoor air pollution that comes from outgassing fixtures, furniture and flooring. Appreciate their grace and beauty – they require so little and give so much. Take walks and look for nature – you can find it, even in the city. Nature pushes through cracks in the cement, and vines cloak old, dilapidated buildings as if to cover crumbling eyesores with something green and beautiful. Join or start a community garden. “Many hands make light work,” is an old saying. Community gardeners can share the garden chores and produce – and build healthy relationships at the same time (another Essential). Invite your neighbors and friends to take regular walks with you. Invite co-workers to take a walk with you on your work breaks. If you need more evidence to encourage your family, friends, or co-workers to tear themselves away from their digital screens to take a walk with you, share this article: How Screens are Keeping Us from Happiness. Last week we mentioned that digital screen time exposes us to blue light that inhibits our natural sleep cycle. At the opposite end of the spectrum, natural light supports our healthy circadian rhythms. So much research has come out recently that reveals how important sunlight on our skin is. It may be best to avoid excessive sun exposure during mid-day, but we all need some sunlight. Out of 30,000 genes in our body, 3,000 have receptors for Vitamin D, which sunlight helps us manufacture. Vitamin D benefits could fill volumes, but here are a few highlights. You can have blood tests to see if you’re at recommended serum levels of 60 – 80 ng/ml. If lower, experts recommend boosting your levels as much as possible through sunlight. If you need more, I recommend getting as much K2 as possible through your diet. If you must take a supplemental form, consider taking D3 rather than synthetic D2. How many Essentials can you incorporate into your new connection to Nature? Take a walk outside while swinging your arms more than normal (move your lymph: Fitness). If you don’t have much time, try walking barefooted for a few steps in a safe, grassy area first thing in the morning. If it’s cold outside (or frosty), even better – it improves circulation, and your connection to the earth discharges unhealthy ions from your body. Breathe deeply and fill your lungs with what I call Vitamin O, oxygen. Smile, feeling the sun on your skin, knowing it’s helping your whole immune system. If you feel inspired, joyous, or more creative, your Human Spirit is shining through. Take a healthy snack on your longer walks and a bottle of pure water, and BOOM! (Two more Essentials: Water & Nutrition.) If your walk makes you feel a “healthy tired,” you may even have a better night’s Sleep! That’s all six Essentials that we’ve covered so far. Take a sheet of paper, and at the top, write Nature. Draw a line down the middle, creating two columns. At the top of the left-hand column, write My Life-Destroying Choices. What life-destroying choices or habits in this one area of your life would you like to change? Write them in that column. At the top of the right-hand column, write My Life-Affirming Choices. Pick some ideas from this article that resonate with you and write them on this side. If any new life-affirming choices occur to you, write those, too. Ask yourself how you can balance your life to include nature every day. To learn more about this Essential, listen to our podcast, The Healing Revolution – Keeping Your Resolution with Nature. You can stream or download related podcasts from iTunes, SoundCloud, UK Health Radio, Stitcher, TuneIn, or iHeartRadio. Listen while you drive, travel, do housework, work out – and take walks in Nature. How is your Healing Revolution journey going? Are you feeling better? Is this one-Essential-per-week method helping you? We’d love to hear from you – share your experiences on our Facebook page.